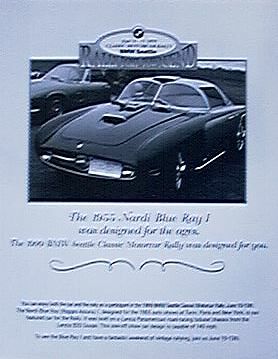 The World's most desirable champagne was again a fitting companion to the classic sport-GT cars at the Rally Port Townsend 1999. 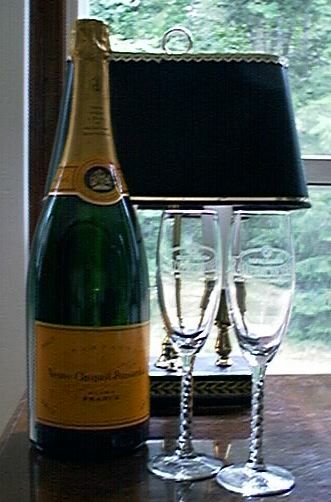 The BMW Seattle Classic Motorcar Rally was very pleased to welcome back as a sponsor, Chateau Veuve Clicquot Ponsardin. On the evening of Friday, June 11th, participants were provided with a champagne reception, courtesy of Veuve Clicquot. Champagne was also donated for Rally teams. Rally participants also received two commemorative champagne flutes. Photos (above right): Steve Norman of BMW Seattle stands beside the Veuve C Clicquot banner at the Clicquot Reception. (below right), Curt Dinen of Clicquot, Inc., chats with Steve Norman, Alan Chockie and Ken Olsen at the Clicquot Reception. Curt Dinen, Regional Representative for Clicquot, Inc., joined participants ant the Clicquot Reception and provided short history of Veuve Clicquot Ponsardin and encouraged everyone to make their New Year's Eve champagne orders early this year.. Curt also made sure each flute was filled with this most famous of Champagnes. For 2000, the BMW Seattle Classic Motorcar Rally moves to a new location at Harrison Hot Springs in British Columbia, Canada. The Rally will run from Thursday, June 9, to Sunday June 12, 2000. The Rally Web pages have been designed to provide you with all the details of the 1999 through 1997 events and preparation for the 2000 Rally. For the 1999 weekend's activities, visit 1999 Rally Schedule.For a list of 1999 through 1997 Rally participants and images of their cars, visit Rally Entries and to see how they finished, visit the 1999-1997 Order of Finish. Photographs of the Rally cars can be ordered from Order Rally Photos and our Rally Store has commemorative items from the 1997 event for sale. To sign-up now for 2000, go directly to: 2000 Registration Form. You can also visit the Web site of our host, the Harrison Hot Springs Resort, our sponsor, BMW Seattle, or the nonprofit organization benefiting from the rally, College Planning Network. The BMW Seattle Classic Motorcar Rally is sharing information with two other regional vintage rallies. The Monte Shelton N.W. Classic Motorcar Rallye can be found via the Alfa Romeo Owners of Oregon at www.alfaclub.org. The Shell 4000 Retro Rally can be e-mailed at welterj@cadvision.com (John Welter). Through the support of our sponsors and participants, over $10,000 was raised to help deserving students plan for college through services from College Planning Network. Thank you.